For years the typical (legal) track to large Wall Street dollars has been: first you get the analyst position, then you get the MBA, then you get the associate position, and then you rise the ranks to MD and start regularly cashing million-dollar bonus checks after the first of the year. But, of course, this isn't the only track. Exhibit C: Peter Orsza -- the Princeton- and London School of Economics-educated, ex-budget director under President Obama, ex-economic adviser under President Clinton, and current New York Times columnist -- just became, at 41, the youngest member of Citigroup's Senior Strategic Advisory group, "a counsel of Wall Street wise men that its bankers can call on to parachute in with advice on complex deals." 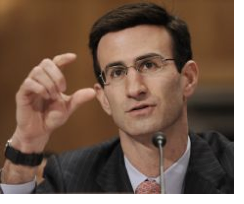 Officially, Orszag's title at Citi will be senior adviser to government officials and private investors. Orszag left his position in Washington this past summer; apparently, he'd had enough of the low-paying government gigs at which he excelled (most recently, he helped create President Obama's stimulus package and health care reform legislation). Orszag wanted to stretch his wings, as well as his wallet, expressing "an interest in becoming an investment banker and a desire to make money, according to people who know him."